On hot and hazy summer mornings in the farmlands of Pennsylvania, everything seems to move in slow motion. I got up before dawn one hot and humid morning to photograph the sunrise over a farm a few miles away. Since the camera equipment was indoors overnight in the air conditioning, I took the camera out of the camera bag when I got into my car. I did this to acclimate my equipment to the outside air temperature. The driving time would be enough for temperatures between the camera, lens and outside air to equalize. The lens and viewfinder surely would have fogged up on site had I not taken this precaution. The air was thick and heavy, and by the time I arrived at my vantage point, I felt like I had just gotten out of the shower and forgot to dry myself off. I set up the tripod and camera at a snails pace, and then took some meter readings from the sky and the foreground. After averaging the readings, I chose an appropriate aperture and shutter speed to obtain the best exposure for the look I wanted to achieve. Then it was just a matter of waiting for the cloud cover to lift and the sun to rise and bathe the scene in soft morning light. Then I high-tailed it back into the air conditioning. In honor of those who sacrificed their lives serving in the Armed Forces of the United States of America. 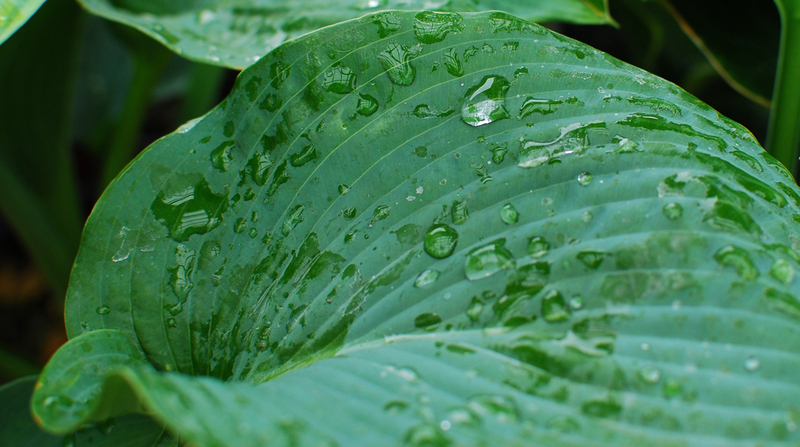 Many folks, ourselves included, have tried with no success I might add, to growing and cultivating many varieties of hostas up here on the mountain. The scenario goes like this. Day one. 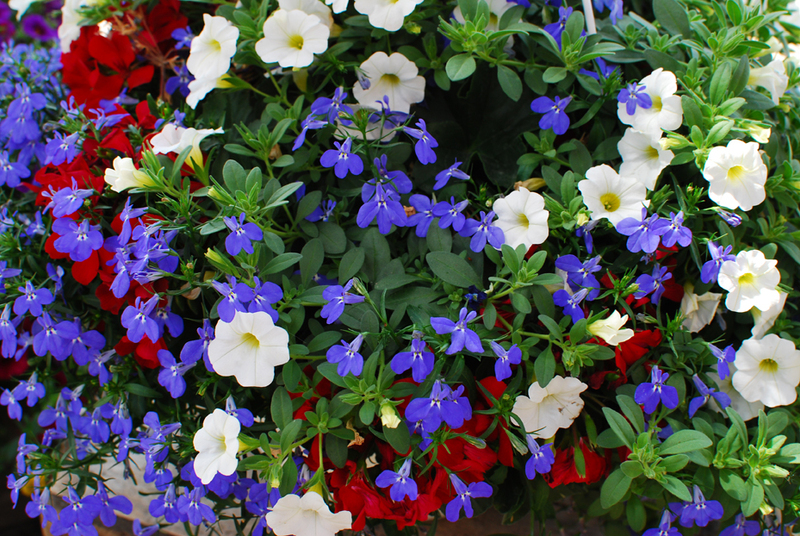 Travel to garden center and pick out the most captivating and healthiest of plants. 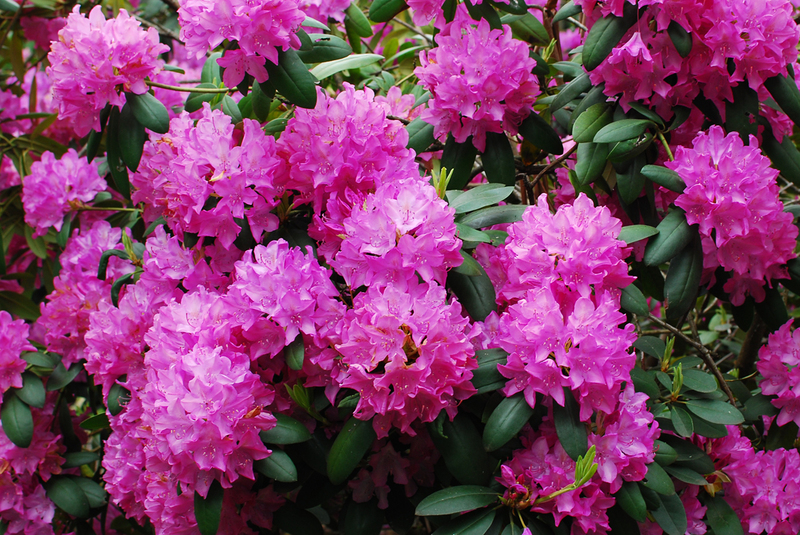 Drive home and plant them in prime shaded areas of the garden. Water well and enjoy fruits of labor. Day two. Neighbors visit and admire the lush foliage added to the gardens. The deer apparently have some kind of telepathic methodology or secret coded message system they relay from herd to herd throughout the region describing in detail where to find the freshly planted specimens. On day three, most of the hosta plants now resemble stalks of celery. While humans and pets slept, the resident herd of 25 or so deer have crept silently around the gardens and visited the “open all night” salad bar. I truly hope the deer feel a bit guilty at times when visiting a newly planted garden. Because you see, they never eat ALL of the hostas at one sitting. They save some for another day. And just when the homeowners hopes are raised, they visit again when least expected and finish where they left off. And, there are a few deer that don’t even wait until it is dark to feast on these leafy plants. We have even seen yearlings on our front porch peeking in the windows, as if to see if the coast is clear. We do have a few plants that survive their gorge on the free eats. This is probably due to a plant nearby not to their liking. The hosta in this photo is one that has remained under the radar and still has all it’s leaves. I swear, I swear, I swear. As I have mentioned in previous posts, I have found one of the best times to go to our farm market for groceries is on a foggy or rainy day. Partly because there are no crowds and the folks who work there can take some time out and chat for a bit. And when I am finished shopping, I can head out to the garden center, camera and tripod in hand, and photograph the marvelous floral displays. When I was there this week the conditions for photography were perfect. It was chilly, foggy and drizzling. Most of the flats of flowers, vegetable plants, hanging baskets, and planters were under roof, so protecting the camera from the rain was not necessary. An added benefit is the clear plastic roof material. It lets in all the light, but protects the plant material and photographers like me from the wind and rain. The even overcast light present under these conditions is perfect for shooting flowers and plants of all kinds. Nature provides the huge diffuser, colors are richer and more saturated, and usually no flash or portable reflector is needed because of the bright even light. 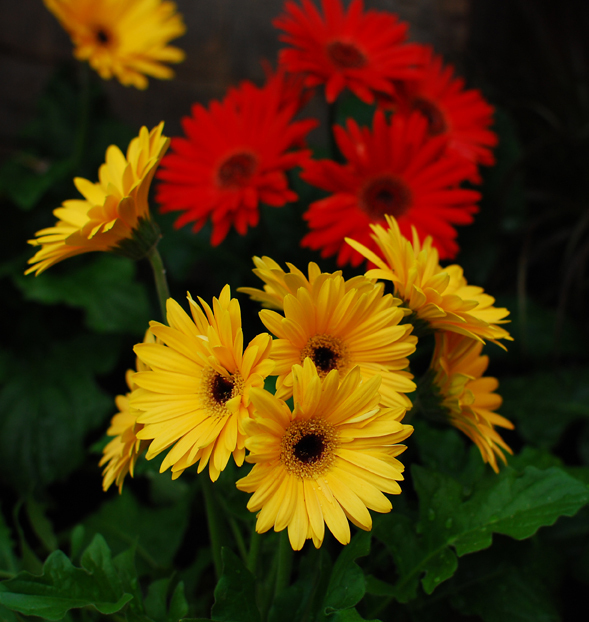 These gerber daisies seemed to light up the entrance to the garden center and welcome me inside for a morning of photographic treats. 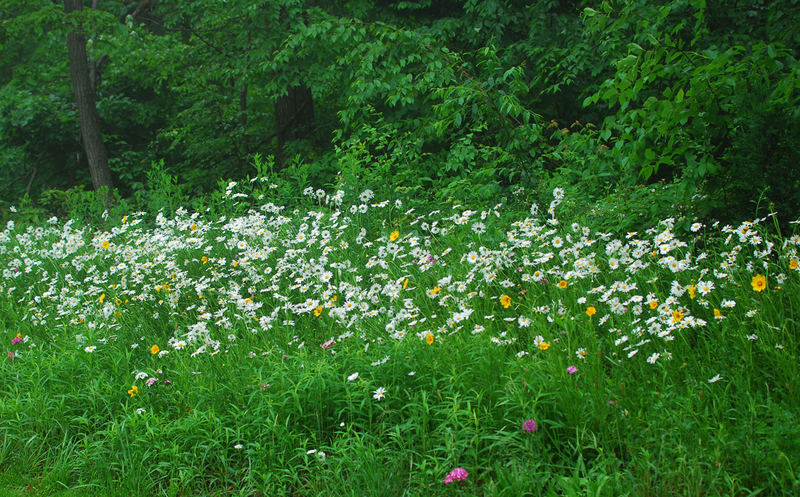 I know I have been obsessing lately about my neighbors’ wildflower garden across the street from our property. Until autumn, the only colors we see here in the woods are the rich and varying shades of green in the leaves with the muted grays and dark brown tree trunks. The sudden splash of color has been a welcome visual surprise. Because of the orientation of our home and the 60 foot tall beech, maple and oak trees, we get a limited amount of direct sun. So we are restricted to mostly shade loving plants. We now have a splendid view of sun loving plants that our neighbor was so kind to plant, since this part of his property faces the sun. On the foggy and misty morning I took this photograph, the flowers really stood out against the green foliage. It was a perfect opportunity capture the eye candy across the road. 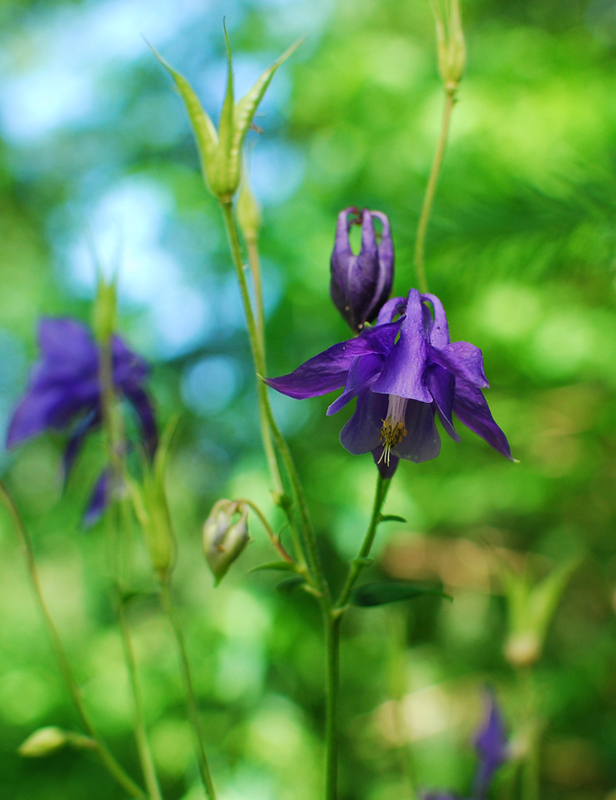 I was out shooting wildflowers yesterday and came across wild columbines growing near some large pine and maple trees. I set the camera and tripod up for a nice composition and initially, the situation wasn’t looking good. It was late morning and the flowers were in direct sun and with all that harsh bright light, the color of the flowers was washed out. But, I had my handy dandy 22 inch collapsable 5-in-1 reflector/diffuser with me to save the day. While kneeling on the ground and looking through the viewfinder, I metered the scene for a good exposure and then held up the diffuser to shade the flowers. The difference in readings was three to four stops. There were two ways to remedy the situation. Choose the desired aperture and then turn into a contortionist and try to meter the scene for the proper shutter speed while holding up the diffuser. Or hold up the diffuser, use aperture priority, and let the camera decide on the appropriate shutter speed. After I had my settings were I wanted, I held up the diffuser to shade the blossoms and to soften the light, and with my other hand, tripped the shutter with the electronic cable release. Using the self-timer would have worked also, but I like the instant response of pushing a button and the photo is taken. I took several shots using manual exposure so I could dial in a little underexposure and also used aperture priority. Both results were good. When I left in the morning it was a bit chilly and breezy, but by the time I found these Columbines, it had become hot and calm. A six foot diffuser would have been nice to shade me on the way home. In a post last week I discussed Depth of Field, and used a photo of a rhododendron flower head to illustrate shallow depth of field. I liked the shape of the flower head, and wanted to isolate it from it’s surroundings. By using a wide aperture setting and the appropriate shutter speed to give a proper exposure, I was able to put the background out of focus. And by doing so, the center of interest became the flower head. I visited the site a few days later hoping the buds had opened so I could capture the flowers in mass with a more apparent depth of field. Using a smaller aperture and the appropriate shutter speed to give a proper exposure, produces in increase in depth of field, allowing the majority of the image in to be in focus. In this photo the emphasis is on the groups of flowers. The sky was bright but overcast, and it had just begun to rain when I took this hand-held photo of this cluster of Rhododendron blossoms. I’m glad I took this shot of the flowers when I did because it’s been raining for two days straight. With that much rain, I will probably have to wait until next year to photograph these flowers again.